The book has the empowering premise that it is possible to improve your marriage, and to improve your marriage you must improve yourself. In the first chapter Johnson outlines the reasons for motivation to accomplish this task: God will be pleased, your wife will be pleased, and your children will be pleased. In Johnson’s next chapter, he roots the path of improvement in Jesus Christ as the model. Unlike the common marriage book, this book is Jesus-centric. 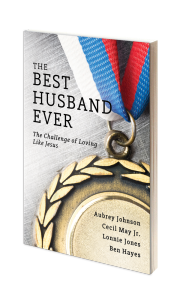 I personally loved how the model for the husband is not merely some physiological functioning, but rather the book calls us to be more like Jesus. In May’s writing, there is a strong focus on the text but interlaced with these thoughts are personal stories of some of the lessons he has learned. His chapters have the vibe of a heart to heart with your grandfather. His biblical insight is marinated through countless years of wisdom. He helps the husband in crucial areas like love, graciousness and support. Jones writes with the spirit of a passionate coach. His writings inspire you to be better. I loved his truthful challenges to his readers. He states “How would Christ treat His bride? How would Christ treat your bride?” (58). Sometimes as a husband you need someone to present the plain challenge to be better. Jones does this through chapters on selflessness, being sacrificial and being forgiving. Listening to Hayes was wonderful because his spirit was one of growing in the Lord. He is in the midst of fatherhood and being a husband. He has four children under the age of 10 and is involved in preaching, counseling and teaching at a local school. Needless to say, he is busy. But he represents husbands during the stage of life when you are trying to raise a family, trying to support a family, and facing this ever-pressing need to be a godly husband. Hayes provides help through three chapters on being helpful, developing a friendship and learning patience. All of the wisdom imparted in the book is wrapped up in the final chapter on the 7:12 mindset. This little tool can have a huge impact on your marriage. It is easy to remember a mindset that can reorient you during difficult times and increase the love during joyous times. Even at the end of the book, you are given biblically inspired advice on how to be the best husband ever.